Chefs and restaurant owners were primarily male dominated occupations some time ago. But in today’s environment, there are many excellent female chefs winning accolades and outstanding women who are successful owners. Brennan family matriarch and Commander’s Palace owner, Ella Brennan, may not have been a chef, but she sure knew everything about cooking and running a restaurant. One of the country’s most renowned chefs, Emeril Lagasse, initially won national recognition and eventual rock star chef status while working under Ella at Commander’s. 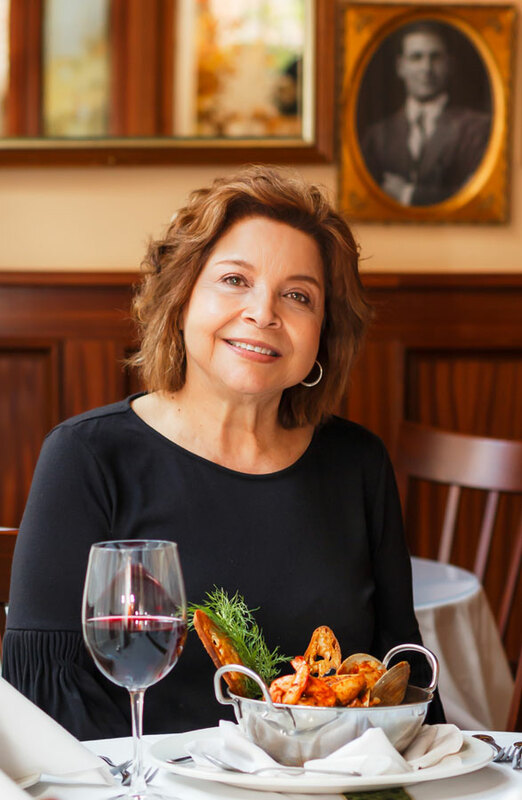 In the recent bio-documentary film, Ella Brennan: Commanding the Table, Lagasse is quoted as saying, “I don't even know if she owns a pan, but she has one of the most amazing palates I've ever run into--ever." A good guess is that Miss Ella’s palate was perfected from decades of hard work in the kitchen with chefs, tasting, experimenting, reading, studying, understanding, and paying attention. Leah Chase, known as the “Queen of Creole”, is a successful, much honored chef and owner of the highly acclaimed, Dookie Chase’s Restaurant. Another trail-blazer, both a chef and proprietor, she joined her late husband in the business, working in the kitchen as well as the front of the house for more than 70 years…. and she’s still at it. Thousands of thankful diners have appreciated the talents and work of these amazing women who have operated thriving restaurants for most of their lives. French Quarterly shares profiles of three more remarkable women who are making their mark in the culinary industry as chef/owners working in the French Quarter and nearby. All three have carried their cultures with them. Pride, pluck, passion and perseverance define these fine chef/owners and many more out there. Irene’s initial French Quarter restaurant, Irene’s Cuisine, at 539 St. Phillip Street, opened without fanfare 26 years ago, unlike the spirited second line parade to their new home on Bienville street. First was the removal of the arched front door of the original restaurant, which was carried to its new venue to be enshrined at some point in the future. Irene’s son, Chef de Cuisine Nicholas Scalco, addressed the assembled crowd. “Irene’s beads” were a good catch, and upon arrival at the new place, a welcome party was in full swing for the marchers and other guests. The DiPIetro family had a much bigger change some years ago when they moved little daughter, Irene, her sister, Renata, and two brothers, Fausto and Sylvano, from their native Sicily to the U.S. The family arrived by ship at New York, and from there, took the train to New Orleans where Irene’s father had a sponsor. Instead of pursuing his trade as a language translator, Irene’s father, joined by her mother, opened a series of restaurants. As the family’s restaurant empire grew, Irene and her siblings joined in the businesses. After her father passed away, most of their holdings were sold. In the late ‘80s, Irene’s brother, Fausto, along with her younger brother, Roland, the only sibling born in the U.S., struck out on their own and opened Fausto’s on Veterans Boulevard. It continues to be a very popular eatery today. Irene cooked at Fausto’s--observing their growing business--and decided to create a little place of her own in her beloved French Quarter, but far from the madding crowds, who would eventually find their way – in droves -- to the little arched doorway at the entrance to Irene’s on St. Philip St.
Irene’s former patrons loved the cozy setting of the three always-crammed little dining rooms, walls covered with photos, family artifacts and showy design like the stained glass window on the ceiling beams in the second dining room. When the new place opened, all the photos and objects occupied the new space. When regulars entered the new establishment, they seemed, at first, blown away by the spectacular, spacious setting: the high ceilings, the windows and artwork, grand bar, ivy-rimmed courtyard…. and the three small, intimate dining rooms. Then most experienced the instant replay of the beloved original. The spirit, the waiters, the ambiance, the familiar objects, the three small dining rooms, and memories of the many years of fabulous dining and great times … all joining us at the new Irene’s! 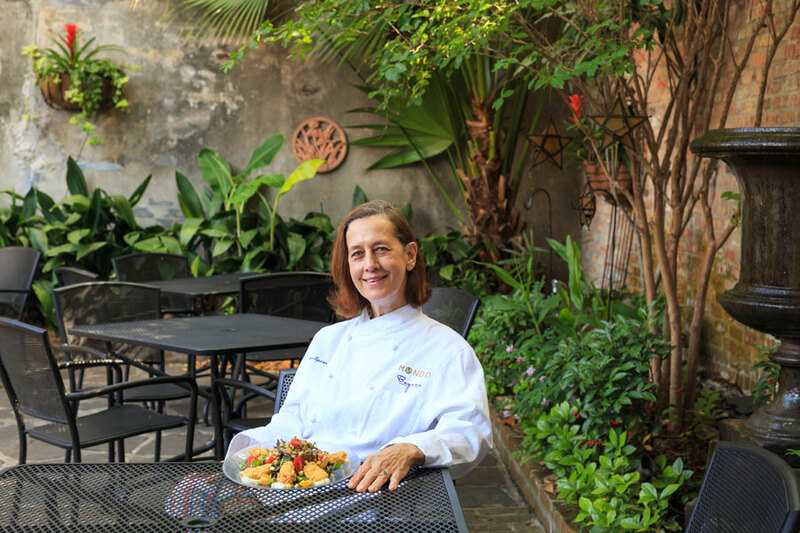 Bayona’s Chef-Co-owner Susan Spicer wasn’t born in New Orleans, but she is surely a New Orleans girl, as well as a world traveler. Born in Key West, Florida, to a family with a Naval officer Dad and a Danish Mom in a family of seven children, Spicer moved around often with her family. The Spicers lived in Holland for several years, a time Susan recalls that her mother, an excellent cook, was preparing intriguing dishes native to Indonesia, France and other exotic places. At seven, Susan’s family moved to New Orleans. After high school, she toyed with the idea of becoming a chef. Her first experience in a genuine French kitchen was with Chef Daniel Bonnot, whom she identifies as both “mentor and tormentor” at the Louis XVI restaurant. She was very inquisitive and eager to learn everything . In her quest to gain more knowledge and experience, Bonnot helped Susan arrange an apprenticeship at Hotel Sofitel Paris under head Chef Roland Durand, Susan’s soon-to-be next mentor. It was 1982 and the early onset of the Nouveau Cuisine movement. Susan experienced an entire new style of cooking. Enthralled with her new discovery, she noted that Chef Durand and his staff created flawless ingredient oriented cuisine with distilled flavors and a more refined presentation. Travels and cooking in California and Europe followed, and an opportunity arose to helm the new Bistro at Maison de Ville in the French Quarter. Susan accepted and learned more about running a restaurant and managing a crew over the next three years. A series of bravos brought several offers to open her own place. One knowledgeable and enthusiastic customer who became a friend offered to back Susan. She and partner, Regina Keever, signed an agreement, and the partnership has gone well with mutual respect and understanding, according to Susan. Bayona opened in 1990 and the awards and honors began pouring in: James Beard Best Southeast Region Chef, Food and Wines 10 Best New Chefs in America, GAYOT Best Female Chefs in the U.S., James Beard’s Who’s Who of Food & Beverage in America Award, Mondavi Culinary Excellence Award, induction into the Culinary Hall of Fame, and many more. Spicer had other ideas. She wanted a restaurant in the warehouse and opened Herbsaint in 2000 along with partners, including her sous chef Donald Link and several members of his family, who eventually bought her out. She has opened two more restaurants, Mondo and Rosedale, on her own and also owns artisan-inspired Wild Flour Breads. Spicer’s philosophy in mentoring is to help employees and managers learn and grow. “It’s very rewarding when the cooks and managers ‘get it,’” she said. Bywater American Bistro, 2900 Chartres St., New Orleans, LA (504) 605-3827. Here in the delta of one of the greatest rivers on earth, New Orleans’ 300 year existence has forged a culture that blends many cultures and many nationalities. They all brought important traditions, recipes and ingredients to this party. Because New Orleans is located so close to the Caribbean, the influence of those islands is keenly felt even to the present day. Nina Compton, chef and owner of both Compere Lapin and Bywater American Bistro, is a perfect example of a person coming to a place with desire to use what she knows but still respect the influence of the area to which she has transplanted. “Growing up in the Caribbean,” she said.. “I really want to bring that to the culinary world since it has not yet been explored-- things that were part of my childhood that I think people would enjoy." Nina was born and raised in St. Lucia and was always moving toward being a chef. Her parents wanted to help her achieve what she desired but were not fully onboard. However, they set up an internship in a Jamaican hotel where Nina fell in love with the creativity and the camaraderie of the kitchen. She went on to study at The Culinary Institute of America in Hyde Park, NY, where she graduated and had the amazing experience of working in the kitchen of Michelin-starred Daniel Boulud and his team in New York City. The training was outstanding. The weather, not so much for an island girl! Next, she moved to Miami and worked with some of the country’s most notable chefs, gaining kudos along the way for herself. However, fate was ready to intervene and change everything. Nina was chosen to compete on the Bravo Network acclaimed show, Top Chef, and it just so happened that this was the year of the show being based in New Orleans. Nina did not win but was the obvious viewer favorite. More importantly, she loved New Orleans and scooped up an opportunity to open in a brand-new restaurant, Compere Lapin, at the Old No. 77 Hotel in the Warehouse District. In show business parlance, she killed it. The artful blend of all the influences in her background, using fresh seafood and spices for which New Orleans is renowned, made for success from the day the doors opened mid-2015. Her husband and business partner, Larry Miller, became the perfect person to stroll the front of the house, as his presence allowed her the freedom to devote her efforts to the kitchen. Compton was named as one of Food & Wine magazine’s “10 Best New Chefs 2017” and Eater National’s “Best Restaurants in America 2017”. 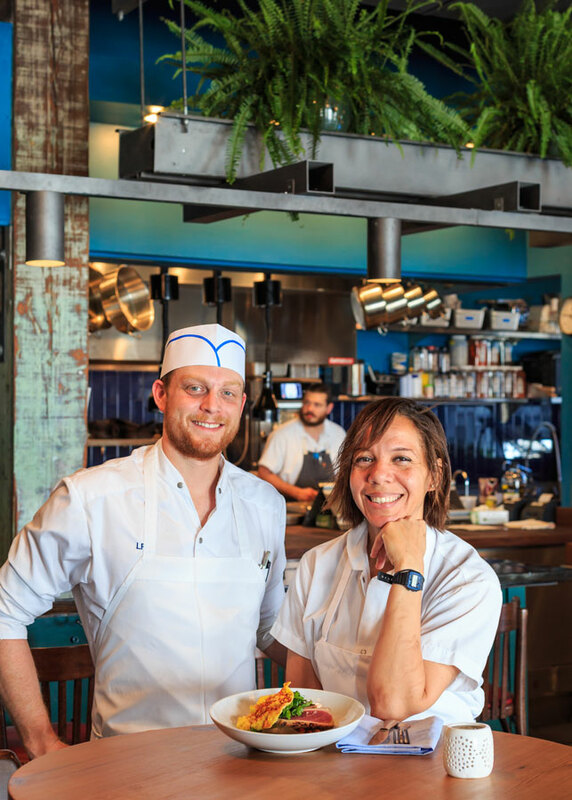 Nina and Larry have just opened a second restaurant in the City’s Bywater district, appropriately named Bywater American Bistro, and the success story continues, again, to rave reviews and another warm embrace from New Orleanians, who first became so fond of Nina on Top Chef. Their partner and chef in the new endeavor is their former sous chef at Compere Lapin, Levi Raines, a friend and collaborator, who came to New Orleans from Miami to work with Nina at the couple’s initial foray into opening their own restaurant. This time the menu is very close to home, with a nod to the building in which the restaurant is located, a former rice mill turned condo development, where Nina and Larry live above the sprawling restaurant.. The exciting menu features hogs head boudin, country paté, oxtail presse, foie torchon, farro risotto, crab fat rice with file, spaghetti pomodoro, seared yellowfin tuna steak with peperonata, smoked ricotta agnolotti and more, which are all sure to impress. The bar program is equally remarkable, featuring New Orleans’ classics as well as modern versions of definitive standards.